To our feeble eyes, Andromeda appears as a dim smudge of light in the night sky. With decent binoculars, its elliptical form sharpens into view. The light we see when peering up at Andromeda comes from the hundreds of billions of stars that compose the galaxy and its spiral arms. If each of those stars were to shine brighter, the image above is what it would like to us on Earth—a beautiful galactic whorl for all to see. The image above was created by Tom Buckley-Houston, who superimposed the Andromeda galaxy on a picture of the night sky with a moon for comparison. 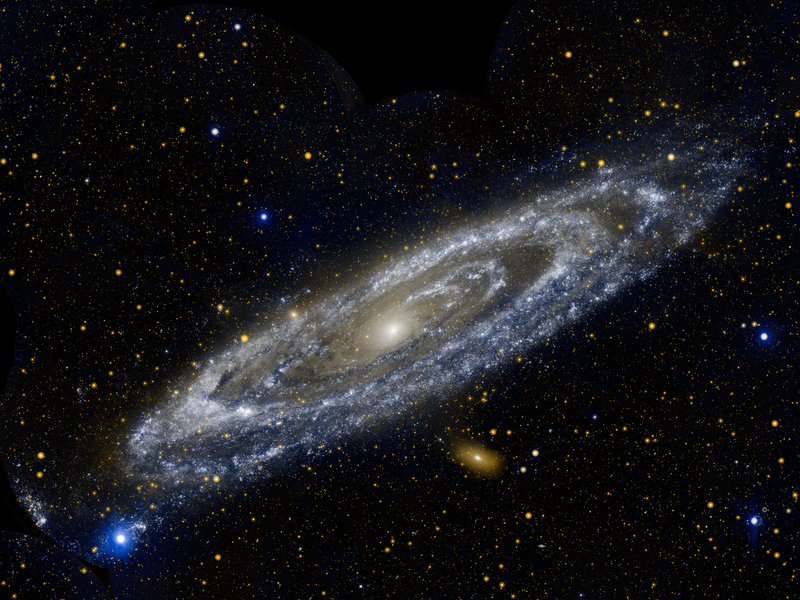 Thus, if possible for Andromeda to be more luminous, it would appear roughly six times larger than our moon. But at 2.5 million light-years from Earth, the galaxy is not as easily seen as the crescent in our sky—which is only 238,900 miles (384,400 kilometers) from Earth. The full extent of Andromeda, according to McConnachie, is at least 20 degrees across, or the equivalent of more than 40 full moons!